The Copper Mineral is one of the family of trace minerals and as such, the body does not require large amounts of copper. However, it is still a very important element of several key body functions and because of this, it is essential that the body maintains an adequate supply of this important mineral. 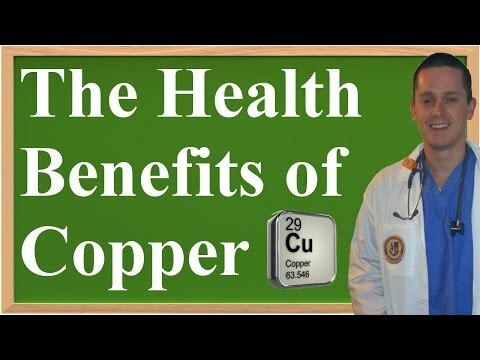 To begin with, copper is a necessary part of the body's ability to produce hemoglobin. It also works together with iron in the formation of red blood cells. Without copper, the body could not complete the process of building the bones that make up the skeletal system. It is one of the minerals the body relies on to help keep bones strong. Strong bones are less likely to break, fracture or become brittle. And bones that are strong can keep osteoporosis from developing. The Copper mineral also plays an important role in the formation of two components that are vital to healthy skin. These two elements are called elastin and collagen. Collagen is present in the skin's connective tissues and it plays a crucial role in the body's ability to quickly and thoroughly heal all wounds. Elastin is what gives skin the ability to stretch and spring back into shape. It is also what helps prolong the onset of wrinkles. Copper is one of the ingredients found in the hair's pigmentation. Pigmentation is what gives hair its color and its sheen. In addition, copper must be present in order for the body to make the neurotransmitter noradrenaline. Copper is also important for lowering the risks associated with the onset of heart disease including heart arrhythmia, high blood pressure, high cholesterol and stroke. It gives the immune system a boost and finally, it is involved in the processes that manufacture important anti-oxidant enzymes. Copper sources include green vegetables, prunes, beans, peas, lentils, potatoes, sweet potatoes, turnip greens, mushrooms, beef liver, fish, mackerel, clams, crabmeat, lobster, oysters, nuts (particularly walnuts, peanuts, Brazil nuts and cashews), pumpkin, sunflower and sesame seeds. Breads and cereals made from whole grains and barley are some good copper sources. The body is able to store this mineral for later use. Because of this, it is not necessary to rely on a daily dietary intake. However there is a recommended daily allowance for copper and it is 1.2 milligrams. The likelihood of developing a copper deficiency is practically non existent although not totally unheard of. There are two reasons for this. First, the body maintains around 100 to 500 mg so it is unusual for this mineral to run low. Another reason has to do with the fact that most people get plenty of copper simply by drinking water. Before PVC piping came along, almost all pipes used to carry water were made out of copper. With copper pipes, trace amounts of copper regularly leach into the water system. When the body does experience a copper deficiency there is usually a corresponding deficiency of iron. That is why anemia is one of the symptoms. Severe anorexia or starvation, and serious kidney problems, which again are very rare can all contribute towards a copper deficiency. Other symptoms include dry skin and problems with hair.